After seeing some very creative use of strip lighting here, on the Strobist site and Flickr, often as ‘rim’ lighting, I thought “If only I had that fancy gear, my stuff would look as good as Joel Grimes’ stuff!” I had visions of after-shoot champagne lunches with Heidi Klune and groups of graceful models in a spacious studio populated with Broncolor and Hasselblad stuff – RIGHT! [Editors note: The excellent intro and tutorial were made by John Hagar (flickr), we are trying to keep it family friendly, so no beer by default…]. 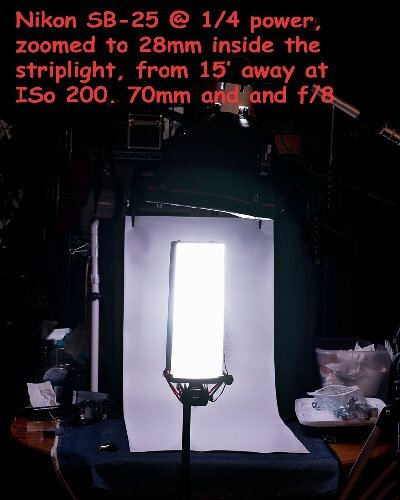 When reality kicked back in, I got around to looking at some Strip-light gear, like the Saberstrip. I’m sure these are fine products, but I figured $130+ is a little much for a light-tube I’ll use once in a blue moon. After all, I can’t bill it to a client as materials and then keep it like the pros do. 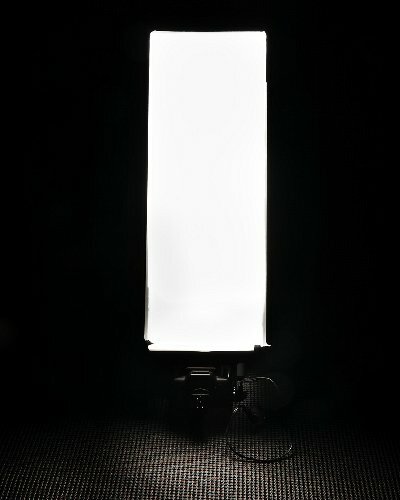 I set off with a goal to DIY my Strip-light for less than $20. You can get a lot fancier than mine with assembly and hardware, but I’m not going to drive it down a gravel road at speed and the odds are pretty small that all those forthcoming models will notice its aesthetic shortcomings amongst the champagne and buffet items at my next shoot. You can skip down to see a finished version (maybe see if this is worth the time before starting). I made one of these a few weeks ago out of cardboard and tinfoil for a friend, and it worked pretty well. But I wanted something more aesthetically pleasing; let’s face it, when you’re into high-tech stuff like Strip-lights, you never know when Magnum or El might show up at the door to book an impromptu fashion shoot. After thinking about a housing for a few days and scrounging through pipes, gutter materials and other stuff in the home despair shops, I happened upon a yard sale where they had a Rubbermaid bread container for a buck (It is not cheap new, but cheaper alternative exist). It looked like it would work and it was cheap enough. The DIY gods were smiling on this venture already. 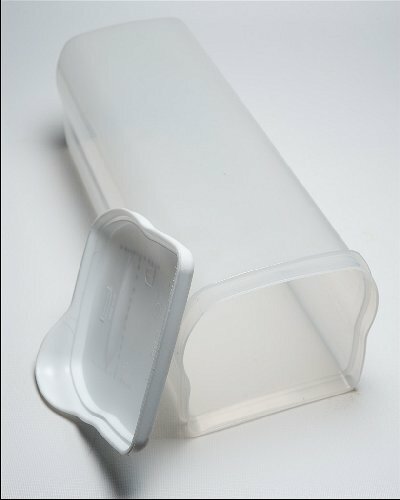 These bread boxes are fairly light, pretty durably-made (maybe stand-on-it durable), and have a flat side that is translucent/frosted for light output. They are just heavy enough that I didn’t want my flash to support the weight of it, which necessitated the strip having its own mounting point (a spigot). This DIY is not a complete how-to, covering every step. A picture’s worth at least 1000 words, so you’ll have to common-sense your way through much of the process. It’s fairly easy to assemble with a minimum of tools. Razor/box knife (and maybe band-aids). WARNING: They call ’em “Razor” knives for a reason. Be careful! 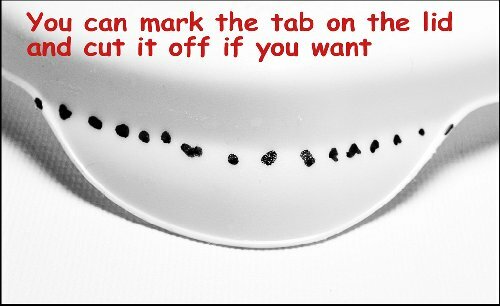 Have a beer hot chocolate, and then mark the lid. 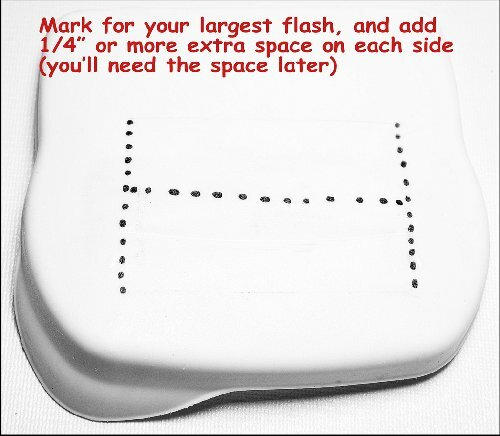 Mark for your largest flash and leave 1/4″ extra all-round. 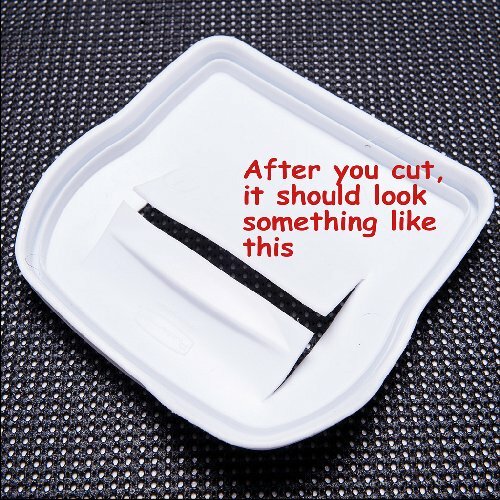 After you mark it, cut an H-shaped hole like this (and optionally, cut off the ‘tab’). To illustrate, this is how the flash will fit in the hole. Jam ‘er in there! The two flaps in the hole steady the flash and allow for different-sized flash heads. 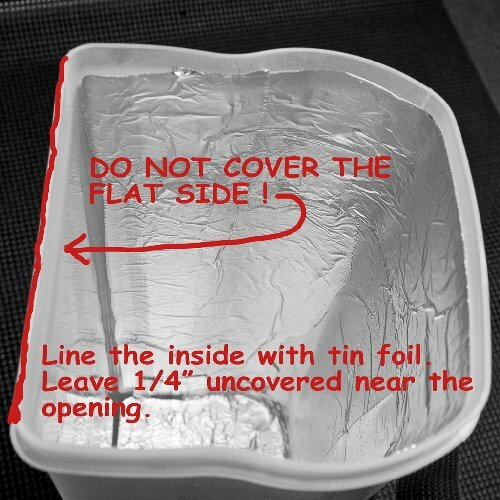 Now, take the lid and flash off and go to step 3. Line three sides and the top with foil. I sprayed the inside with adhesive and put the foil on, smoothing it as best I could. If you miss a spot, just spray/brush a little more glue and patch over it until all three sides are well-covered. If it looks like hell, don’t sweat it. Your clients will never look inside, and neither will anyone else. The whole outside gets covered with gaffer-tape anyway. If you get glue on the flat/front surface, a little lighter fluid on a rag will clean it up fast. That side shows, and is where the light comes out. Have another beer hot chocolate (or two) and, if you just can’t wait, you can put the lid and flash on and give it a quick pop. Start low, this thing transmits a lot of light. 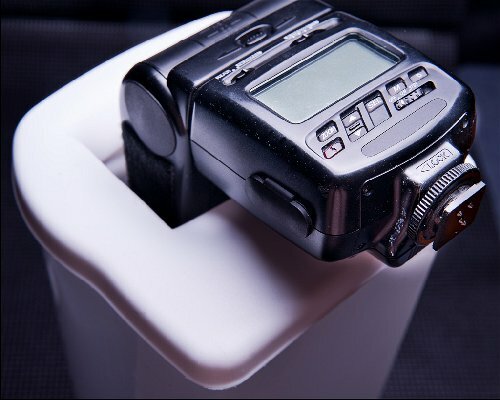 This is 1/4 power on a Nikon SB-25 at F/10 (I believe at ISO 200). Don’t worry if it looks a little funky, the hot chocolate and glue fumes are probably doing their job. Put the spigot on. I did step 6 first so you can see the spigot-mounting stuff in a shot. It is easier to mount the spigot now and cover all but the actual spigot in the next step. WARNING: The can lids are slice-yer-finger sharp! Be careful here! Remember, beer hot chocolate dulls pain; have another one before and after this step as needed. a) Open the spaghetti sauce now. Empty the can and save the sauce for later. Keep the top from the can and open the bottom and keep that tin disc too. I put the lids together and pounded them on a piece of wood with a rubber mallet to get the sharp edges flattened. Throw the can carcass away unless you have an iron snoot DIY in mind for later. b) Drink more beer chocolate. c) Clamp the two can lids together and drill a 1/4″ hole in the middle. d) Drill 4 – 3/16″ equidistant holes about 1.2″ from the edge. KEEP THESE CLAMPED TOGETHER UNTIL THE DRILLING IS DONE TO KEEP THE HOLES ALIGNED. MIGHT NEED MORE HOT CHOCOLATE HERE. e) Put one lid on the outside of the Strip-light and drill through the Strip-light at each hole (1/4″ in the center, 3/16″ for the others). 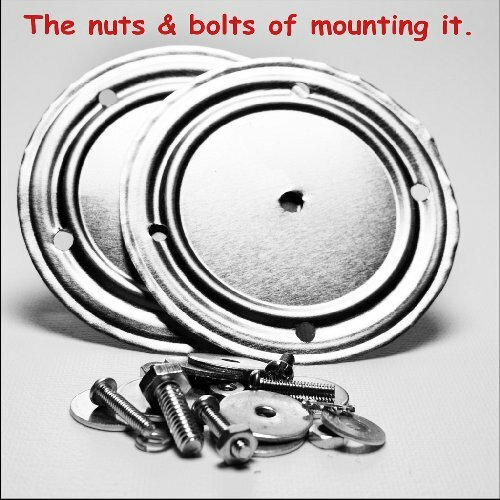 f) Put the 1/4″ bolt with its lockwasher on through the center of one lid and the stripbox (FROM THE INSIDE). Put the other lid on the bolt outside the Strip-light and LOOSELY screw on the spigot so you can turn the lids and align them in the next step. g) Align the holes (might require more beer) and put the 4 smaller screws through the lids and the stripbox. There should be a fender washer on the outside and the inside. 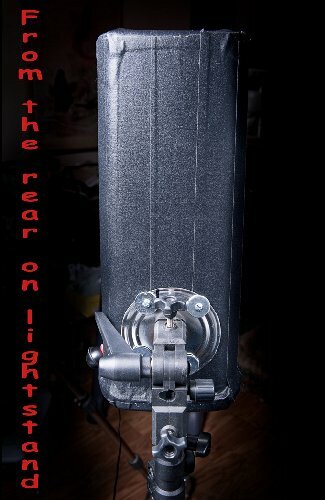 The screw heads should be on the outside, and the nuts and lockwashers on the inside of the Strip-light. h) Tighten up EVERYTHING well. You can see what this looks like further down. 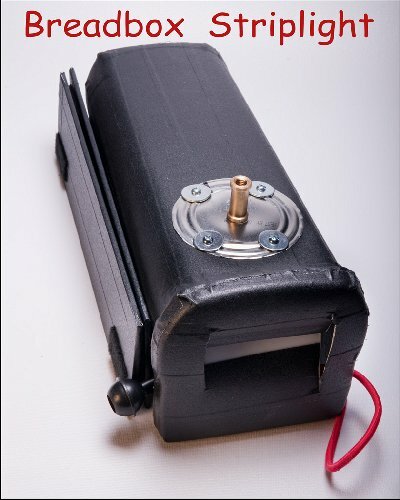 The spigot is mounted very near the flash-end so that it will balance well with a flash attached. 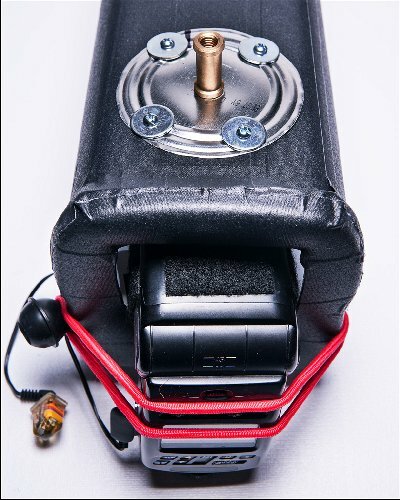 The purpose of the can lids and fender washers is to distribute force on the spigot across a larger area of the box so it won’t break off when your lightstand falls. IT WILL FALL EVENTUALLY; I PROMISE! Put the lid on and stick the flash through its hole. Figure out where you need to thread your strap (mine’s a ball-bungee, but you could use elastic or wrap a couple of huge rubber bands around the whole rig) through and drill holes through the box above the protruding lip. Thread the strap through the box and leave it hanging for now. Cover everything with some gaffer/duct tape. Since my local camera shop gets $22 a roll for this stuff, I’m a little sparing with it. The spigot mount is uncovered below so you can see what the mounting looks like. On my next one, I’ll cover everything but the actual spigot. Have another beer hot chocolate or two. I made a couple of gobos (barndoors) from some Coraplast sheet. Some good cardboard or plastic cut from a square kitty-litter bucket will work too. Remember the DIY “gridded snoots” that used Coraplast for the grid? Still have mine and use ’em a lot. I covered ’em with gaffer tape and put the velcro tabs on later when I could line ’em up with the Strip-light. I made a small barndoor that goes between the top of the side ones and makes a “box” out of the top. 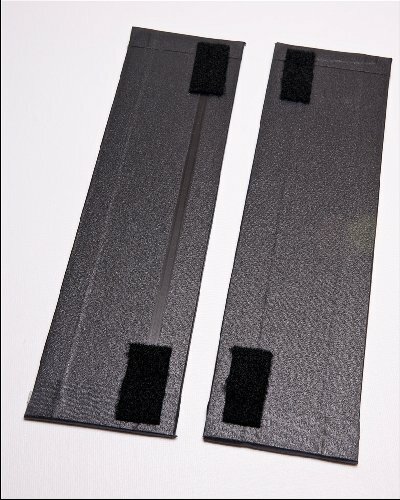 These are about 3″ wide, and stick out in front of the flat face of the Strip-light about 2″ or so. Make dinner with the spaghetti sauce, have a couple of cold hot ones and relax while you wait for the contracts to roll in. Oh, yeah, you might take a few shots with your Strip-light(s) to see if they actually do lure in a few supermodels. 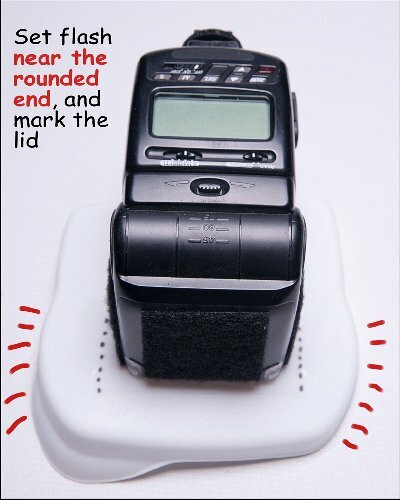 If you are using a good strap to hold the flash on, you can leave the lid un-taped so you can stuff gobos and other junk (even a flash) inside for transport. I didn’t use this DIY to pimp my iffy photo skills, so if you want to see shots of the light pattern or anything else, make your own version and shoot it. Let me know how it turns out. 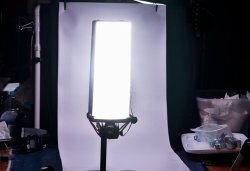 For my next DIY, I’m thinking of how to make a Broncolor strobe from old electric toothbrushes and a Vivitar 283. Probably take more beer than this one.